Come join our Machine Embroidery (M.E.) Club! Each month we will have demonstrations, patterns, and suggestions. But most of all, we want to share inspiration and are inviting you to show what you have done with Machine Embroidery! Bring up to five items for show and tell, and we'll give you 10 reward points per item!!! That's 50 reward points you can earn each month! The classroom is open for anyone who wishes to come visit with friends and finish a project. FREE! This is a class for both those who have never quilted before, as well as the experienced quilter who would like to make their quilt straighter or would perhaps like to design their own quilt. Everyone will come away with more knowledge about the art of making straight and accurate quilts after taking this course. Come in and Test Drive a new Bernina! Debbie will show you the beauty and capability of a Bernina! Complete the Test Drive and you will receive 10% off any purchase made that day! Join us in learning more about your fabulous Bernina Machine. Each month we will try out different machine features. Come in, learn new techniques and expand your current sewing skills. This club also includes "Feet"uses - learn about the different Bernina Feet and how to use them! Come in and make your own monogrammed canvas tote! Tami will guide you through putting your initials in one of several different designs and then embroider it out. Sew up two side seams and your tote bag is complete! Let Dee show you the wonders of quilting in making this simple raw-edge applique coffee mug rug! The adorable design includes attaching a Potomac River Glass & Pottery cup handle. These cup handles were collected from a beach in Prince William County and add that special touch to your mug rug! By popular request, we will dedicate one Saturday a month as Open Sewing Day.The classroom is open for anyone who wishes to come visit with friends and finish a project. FREE! This is the start of a new series - and the store will be open while this class is in session. Many of you know Tami at the store, and she wants to start a "join me" time to sew projects that she is interested in doing - if you'd like to join her and sew along, then sign up. This is a FREE session - built on the fact that the group will figure out how to make the project and help each other along. Although she won't be there to teach anyone how to sew, quilt, or embroider, she will help where needed. Join us to sew items for charitable organizations. We make pillowcases, especially holiday/birthday, for donation to Washington D.C. Children's Hospital. We may expand to other projects as the group wants to take on more! No sewing experience needed! We provide the fabric for the projects, but we also welcome donations of any leftover fabric you may have. Bring in your own machine and sew with us! Registration for this class is over and class is full. If you registered prior to 15 February, you may sign up online and pay each month. Fabric Kits will be provided only to those who were registered prior to 15 February. Join us in making this beautiful quilt by Nancy Rink, with Marcus fabrics. 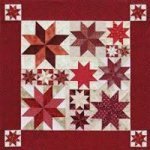 The Amish-inspired quilt merges elements of a traditional Amish Trip Around the World with a unique center star and a variety of colorful blocks, all set against a black background. Each month we will provide the fabrics and instructions for a different block! Quilt Club meets on the 2nd Thursday of each month. Our agenda is FUN, FUN and more FUN! Come get the latest upcoming news and events in the Quilting World! Come see our NEWEST FABRIC COLLECTIONS! Bring your SHOW AND TELL to share! We will have prizes and best of all, regularly priced merchandise will be discounted 20% for all attendees! There is no charge and everyone is invited to be part of this fun group, regardless of skill level! The second Friday of each month, come join us for an evening of wine and sewing. Bring a snack to share and we will provide the wine and paper products! This club explores the world of the Accuquilt GO! system. Learn how GO! saves you time in preparing your quilt fabric. Share tips and techniques to get the best cutting. Learn to use the shapes in quilting, appliqu?, and embroidery.